Mediante o uso de nosso site você é conciente do uso de cookies Mais informação - Ok, entendido! Jose is a Latin-American living in Canada, who has an opportunity to travel from one of the coldest region in the world to the middle of a tropical paradise, "La Montaña Azul", a retreat center located in the central of wilderness Costa Rica, to live his life-changing experience with Ismael Cala. It all started with Jose entered Cala’s charity sweepstake, and luckily became the winner of this amazing campaign. This was a very meaningful and unique experience for Jose since Ismael Cala has always been his role model. 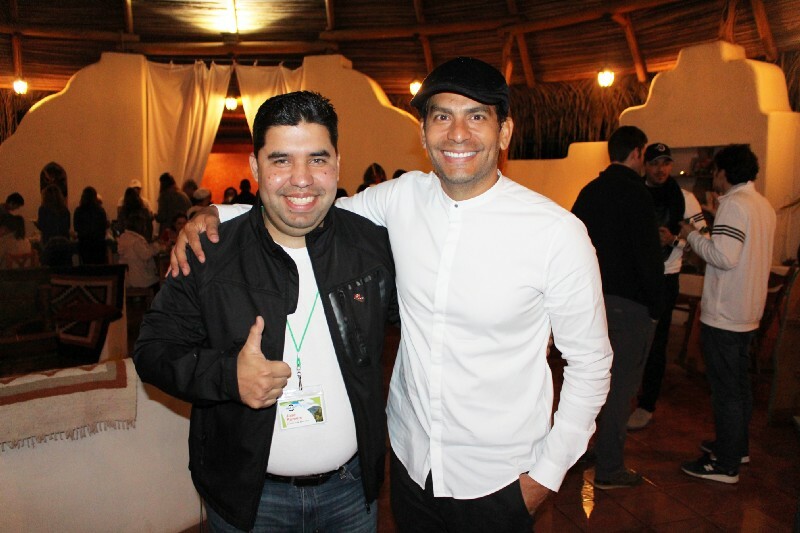 After years of trying to meet him, Jose finally had a chance to do so by winning this sweepstake and had the opportunity to open his mind and change his perspective of the world through spending some quality time with Ismael Cala in Costa Rica. Namaste! However, it is more important to recognize that each and every participants have greatly contributed to Ismael Cala Foundation’s cause and helped make an impact on their leadership and vocational programs for children from Latin-America. How would you describe "La Montaña Azul" now that you’ve been there? "Spectacular. It’s a place out of this world. The biggest butterflies I’ve seen in my life, those nocturnal sounds, those plantations, the company of such wonderful people, the absence of basic elements like the internet and that feeling of being isolated from the world…"
What about meeting Ismael Cala and spending some days of meditation with him? "It was really exciting and the fact of being able to open myself to a person full of experiences and knowledge is something that filled me with joy. Ismael always gives his best to everyone." What did you learn from him? "In short, that self-control is the key to the knowledge of oneself. We shouldn’t exceed our emotions. We are what we decide to be, and we shouldn’t let our mind condition us with past experiences and predispositions for the future. If we control our minds we’ll feel more freedom in life." Would you encourage people to participate in charity sweepstakes? "Undoubtedly, this is a great initiative. Sooner or later dreams like these come true. It is a worthwhile experience and everybody deserves to live an adventure like this." Do you want to win your dream experience? Ainda não há comentários, seja o primeiro! Obrigado por enviar seu comentário! Com seu registro, aceite receber indicações sobre nossa campanha.